As a teenager, Joseph Medicine Crow heard eyewitness accounts of the 1876 Battle of the Little Bighorn from his step-grandfather, White Man Runs Him. “He was one of Custer’s favourite scouts,” Herman Viola of the Smithsonian Institute wrote in the preface of “From the Heart of Crow Country”, one of Medicine Crow’s many historical books. White Man Runs Him lived with Joseph in his older years and many non-Indian historians came to listen to his memories of the Little Bighorn. But the old man eventually stopped talking to them because they didn’t believe some of the things he told them, especially the notion that some of the 7th cavalry drank whiskey before going into battle. Raised by traditional Crow (Apsaalooke) grandparents who recalled life before being pushed onto reserves in the United States, Medicine Crow grew up on stories his grandfather’s friends told after sitting in the sweatlodge. Many of their stories dealt with war. The old ones believed First Maker had given them the best place on earth to live – temperate climate, cold lakes and streams, and early on, too many buffalo to count – for a reason. He wished to test their courage by surrounding them with the most fearsome, militant tribes of the lower plains, the Sioux, Cheyenne and Blackfeet, who wanted to take their land, steal their horses, and capture their beautiful women. The old men’s recollections of enemy attacks helped the young High Bird (Medicine Crow’s Crow name) to understand why his people befriended the white man and served as allies in battles between the U.S. Cavalry and their enemies the Sioux and Cheyenne. “My grandfather trained me to be a warrior,” Medicine Crow said in a 2013 Indian Country Today news story. As a boy, High Bird grew accustomed to endless walking, sleeping only on the floor with a blanket, jumping into icy water, and snapping to alert attention upon awakening. He put his military skills to work as a Second World War soldier, interrupting studies for an advanced degree in anthropology. Unbeknownst to him at the time, four of his daring acts qualified him to become a Crow War Chief, the last of his people to be named as such. As a scout, he led several successful war parties deep behind enemy lines – red war-paint under his uniform and a painted eagle feather tucked inside his helmet. He seized explosives, stole German horses; disarmed an enemy; and touched an adversary (counting coup) without killing him. Most oft-written about is Medicine Crow’s horse-raiding escapade. Through his field glasses one day in 1945, he noticed SS officers riding horses toward a farmhouse. He decided he would make off with the animals – mounts so respected by his people – before the Americans bombarded the area with artillery. He tracked the soldiers to a stable and, at first light, crept past the guards to slip a rope halter on the best of the herd of 50, a thoroughbred with a white blaze. Only back in Montana, according to Adrian Jawort’s account in Indian Country Today, swapping war stories with the Elders, did Medicine Crow realise he had unconsciously performed – by grabbing the explosives, seizing the enemy soldier’s rifle; touching him (instead of killing him), and stealing the horses – the four deeds that established him as a war chief of his people. 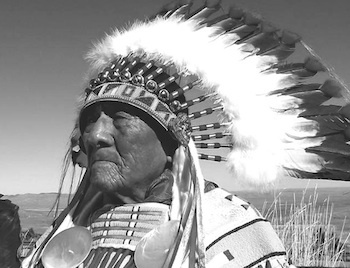 At his 100th birthday party in 2013, Medicine Crow told the crowd that Plains Indian warfare was not about killing so much as leadership, honour and intelligence. He recalled his boyhood in Lodge Grass, Montana, the son of Amy Yellowtail and Leo Medicine Crow, and how the stories of his people’s war chiefs inspired him. Though he didn’t consider himself an overly intelligent man, Medicine Crow often told his only son, Ronald, that he did have a love for learning, and that penchant had gotten him somewhere in life. He studied sociology and psychology for his bachelor’s degree, and earned a master’s degree in anthropology from the University of Southern California in 1939, the first member of his Crow tribe to obtain such a height in education. After his birthday address, tribal members shared stories of how they were inspired by their ‘grandfather’ Medicine Crow to join the military or pursue higher education. Back in 1948, following his military pursuits, Medicine Crow returned to books and history, and was appointed tribal historian and anthropologist. He did some work for the Bureau of Indian Affairs in land management, and was a board member or officer on the Crow Central Education Commission. His script encapsulating the saga of the Battle of Little Big Horn has been used at the war re-enactment every year in Hardin since 1964. In 1999, he addressed the United Nations. He continued to write and lecture at universities and public institutions until his death last April 3 at the age of 102. At least 700 mourners attended his funeral and Montana governor Steve Bullock ordered flags to be flown at half-mast. Medicine Crow left his extensive collection of writings, cultural lectures and photographs documenting Crow history to the Little Big Horn College Library. “It’s our most used archival collection by students and community members just because of grandfather’s stature in this area. Everyone knows how well he kept Crow history,” said Tim Bernardis, library director.